PETA members might not like this one. 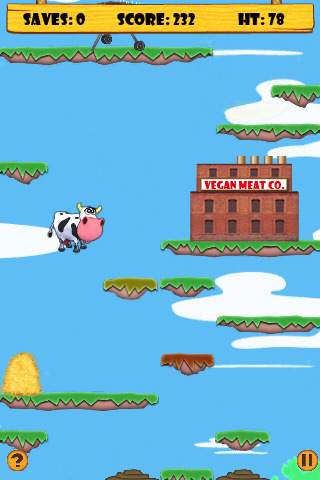 Save Betsy is another auto-jump guided platforming distance game where you control a cow named Betsy and you have to tilt your iDevice to avoid grills, grinders, electric fences, and other horrible fates for a cow as you try to escape into space. This tongue and cheek game is brought to us by Hairy Monster Studios LLC and is available on the iPhone, iPod touch, and iPad for $0.99. This app is designed for both iPhone and iPad. Save Betsy is a really thought provoking game. I don’t think there has ever been a game where you can watch, in real time, as your cute big-headed, sad-faced cow jumps onto a grill and instantly turns to a big juicy steak or a grinder that literally grinds the entire body of Betsy into ground meat. My girlfriend literally yelled that this is a horrible game when she saw that. I can’t blame her, yet I still like this game. It’s the bluntness of this game that makes me laugh. Save Betsy is a game that asks that you not take it seriously. Gameplay wise, it’s the exact same game as any other jump platform distance games. You automatically jump, there are standard platforms, break away platforms, and moving ones, there are enemies you can shoot (in this case, Betsy will launch a cow dung bullet at the enemy… ew) and there is a powerup that launches upwards. This is the World War II to the shooter genre. Graphically, much of it could make use of more detail but the character Betsy is really nicely done. There is an appeal to the animations of Betsy’s death, though I’m sure some people might get offended. Sounds are basic and nothing memorable and the little cow-facts that pop up when Betsy dies are actually quite interesting. Did anyone know that a cow drinks a bathtub’s worth of water every day? Overall, this is a strange little game that will probably lose some sales thanks to the images of violence against cows. I, however, am a carnivore that loves meat, so I thought this was great fun for a short time. AppSafari review of Save Betsy was written by Joseph Ho on September 26th, 2010 and categorized under App Store, Games, Platformer. Page viewed 2902 times, 1 so far today. Need help on using these apps? Please read the Help Page.